baroque is a Japanese rock band, formed in 2001. 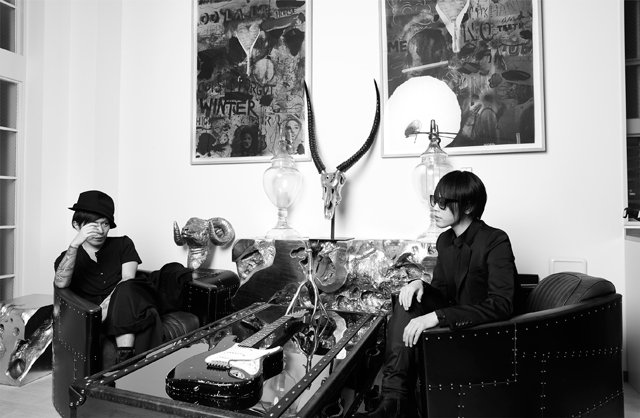 The band formed when the guitarist Akira (from Shiver) and bassist Bansaku (from After effect) invited Ryo (the vocalist of kannivalism) to their new band. Kei (圭) (the guitarist of kannivalism) also joined with Ryo. That time baroque also had a drummer named Naru (ナル). baroque debuted in July 2001 and went major rather quickly doing their first one-man in August 2001. Upon forming, baroque retained a sort of visual kei image, but they lacked the “darker,” more goth aspect visual kei usually presented. Because of this, baroque are considered to be the founders of oshare kei – the happier, more fashion-conscious side of the visual scene in Japan. In their later days as a band, baroque rid themselves of this visual style and opted for more casual, everyday clothing instead. In April 2002, Naru left the band and new drummer Yuji replaced his place in June 2002. But in May 2003, Yuji also left the band. baroque disbanded in September 11, 2004. This happened ten days after releasing their first album: “sug life”. It is said that reason for their disbanding were Bansaku’s doubts towards his bass skills, so because of this he wanted to leave the band. The other members, unable to see their band going on without their friend, also decided to end the band.